Gold leaf is the most fragile of materials, and cannot be handled in any other way than by the traditional techniques developed over centuries. By rolling and hammering it has been reduced to a thickness of about 1/300,000 of an inch. A breath of air can dissolve it. And yet it remains inert and permanent, and will neither tarnish nor change its colour. 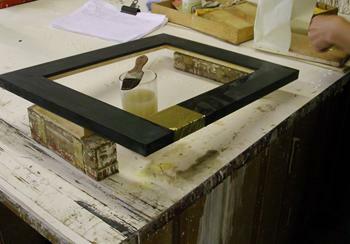 Once the frame has been gessoed and painted with bole (a black bole in this case), 22 carat gold leaf can be applied to the frame. The leaf is lifted with a gilder’s tip, a flat camel hair brush, whilst at the same time the frame is brushed with water to receive the leaf. The wet surface acts like a magnet, drawing the leaf from the brush. In this case two gilder’s tips are used, held overlapping to extend the reach of the bristles, so that a complete leaf can be transferred directly from the book of leaves to the face of the frame. For the frame’s edges the leaf is first laid out flat on a leather gilder’s cushion, sheltered from air currents by a screen at one end, where it is cut into smaller sections, before being applied to the frame. When the gilded surface is dry, a bright mirror finish can be produced by rubbing with an agate burnisher. If necessary, the brightness can be increased by reburnishing a few days later, or decreased by rubbing with pumice powder.